If you need another reason why DRM does not make sense whatsoever read on. The PC version of Gears of WAR apparently had am expiration system built-in to the game client that ran out on January 28, 2009. That's right. If you legally bought the game you were not able to play it anymore because of the expiration of the digital certificate. Does it make sense to specify an expiration date? Not really unless you rented the game to PC gamers instead of selling it to them. Probably as disturbing is the fact that it is possible to overcome the problem by changing the date of the system to a date before January 28. If this was supposed to be some kind of protection it was more than useless considering that the system date is used to check whether the certificate has expired or not and not the actual date and time. 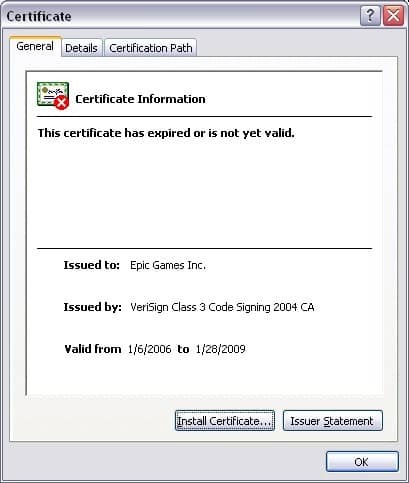 It does look more like a blunder of someone forgetting to renew the certificate for the game. That again leaves the question unanswered why the game needs a certificate in first place. No word yet on the piracy front but bets are 10:1 that the pirated copies of Gears of War are working just fine. If you bought the game you can either change your system date or wait for an official patch which is said to be out soon. Epic Fail so to speak..
A number of secure websites encountered the same issue. The signing authorities used to provide a certificate chain that expired Jan 28, 2009. I had to update the chain on one of the websites I manage. When you post this type of article it would be a great service to us for you to also post a link or e-mail we can use to chide them for their error [and possibly push along the fix]. I own the game, but I just bought it on sale, and I haven’t even opened the package yet. Who better to tell them what I think of their little game.